3 November 2011, Singapore – 13 girls selected from 45 girls last Sunday competed to vie for the Singapore leg of the Elite Model Look tonight at the Red Dot Museum. The runway collection tonight were from Guess 2012 Spring Collection of Sports, Ready-to-Wear, Swimwear and evening wear. The winner, 175 cm tall and 15 year old. Fiona Fussi who is a Singapore resident of Hong Kong and Austrian heritage would be heading to Shanghai on 6 December 2011 to compete with almost 80 peers from 60 countries. Over 400,000 entries were received from these 60 countries. 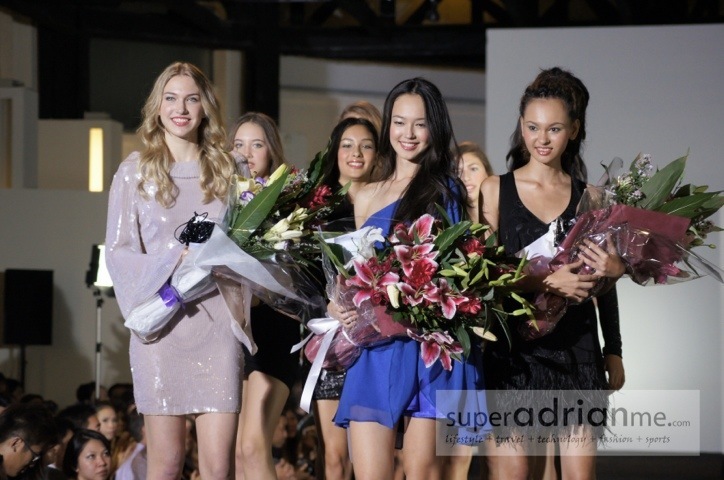 16 year old Danish, Louise Arild, who is 177cm tall came in 2nd Runner Up while 175 cm tall and 18 year old Singaporean Putri Diana Abdullah came in 1st Runner Up. Louise will be going to London while Putri will be going to Paris for an all expense paid trip to cast in the two offices. Jeremy Tan, Fashion Producer for the Audi Fashion Festival and Blueprint exhibition, Francis Cheong, renown fashion designer, the Elite Model Look panel of directors and special guest judge, supermodel Philippa Lett were the judges for the night. There was an additional award – the Blueprint Runway Model Award. 15 year old British Maddie Cox, 178 cm tall, would be participating in three of Blueprint Fashion Shows in 2012. Do check out the entire set of photos on our Facebook fan page. Check out Fiona Fussi in a kikki.K paper dress here. ayoohhh 2nd runner up disgasting foh what!!!? Why don’t you post a picture of yourself and we’ll see how that goes? dis winner ah.. so ugly lor! beauty is in the eye of the beholder, I guess. you think fiona is ugly? lets see your face then. i bet your just jealous your fav model wasnt the winner.